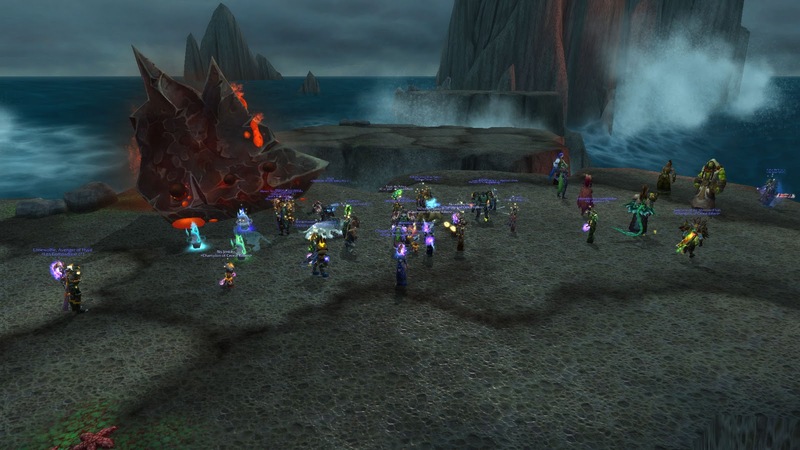 On Wednesday night, Cereal Killers downed Ultraxion in 10 man normal Dragon Soul. If you've read my little snippet of a post, you can see that we barely beat the enrage. I even think using the word "beat" is somewhat of a stretch. I'm only going off DBM's text that informed me that Ultraxion died after exactly six minutes here. Since there wasn't a warning for the boss's Twilight Eruption cast, I think we may have had the fight finished at exactly the 360 second mark. At the time of the kill we had obviously gotten the main mechanics of the fight down well enough. Our only hiccup was when one of our tanks died at the two minute mark. From what I can see on the WoL parse, it looks like Bento took a dirt nap because of healer derp. Out of 13 total attempts, five of them were more or less at the enrage. By try 13, we'd all more or less decided that we just didn't have the group DPS required for the encounter. As you can see, we managed to pull it off in true CK fashion, right at the enrage. Ultraxion and my guild's experience with him is representative of our approach to raiding. At first glance, none of us really knew we'd have trouble with the enrage timer. Last week's attempts had me in a healing slot with our discipline priest on DPS duty. That wipefest never amounted to anything close to a kill, so we didn't even consider the lofty-ish DPS requirement. In the guild, it's accepted, without any pomp or arrogance on my part, that I'm a better Ret Paladin than Syuveil is Shadow Priest. Out of the ten of us in the raid, it seems like Syuveil (who goes by "Hammer," and will henceforth be called that,) and myself were the only ones aware that we might need to change our DPS makeup a little to find success. Hammer is our raid leader and he did a couple of things this week that were key to getting us the kill. The first was putting me in as a DPS. 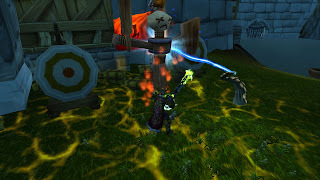 The second thing involved our raid group's mage, BLS. 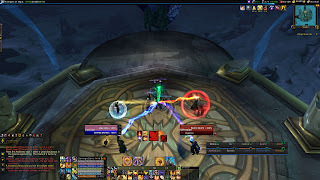 Hammer and BLS are an example of the kind of min/max tweaking that we, and other fairly casual raid groups, may have to engage in to kill Ultraxion. Coming out of 4.2 and ultra-nerfed Firelands and going into Dragon Soul, it was pretty easy to be satisfied with our minimal effort. In the first week we went 4/8, with absolutely no wipefests. We actually hit the enrage timer on Yor'sahj once, but I think that was actually our first attempt. After wiping at 60k, we made an adjustment and won that fight pretty easily. Ultraxion changed the game by forcing us to actually think of the fight in terms of absolute minimum DPS. Here's a bit of numbers to show you how we did it, and why it was nerdscream worthy. Here's a link to our WoL parse for the kill. Ultraxion has, in ten man normal, 56 million HP and a strict six minute enrage timer. That means your raid has to do 155,555 raid DPS in order to kill the boss in 360 seconds. Removing healers from the equation puts each tank and DPS at 22.2k required. Cereal killers provided 33.5k of that raid requirement from our two tanks and our smite healing maniac Hammer. That leaves a required minimum DPS of 24.4k for the remaining five players. As you can see from the parse, only two of our DPS accomplished the minimum requirement. My effective DPS was 28.8k, which allowed for a bit of breathing room, but only lowered the minimum requirement for the other four people to 23.5k. Only one person managed to hit this minimum. Our mage and our shadow priest were at 22.6 and 21.6k, respectively. According to WoL, we eeked out 156,302 total raid DPS. Given that our average item level throughout the group should be at or above 378, I feel we can do much better. What follows is a few ways we can improve. These tips are obviously universal and in fact are more or less things you should probably do all the time anyway. 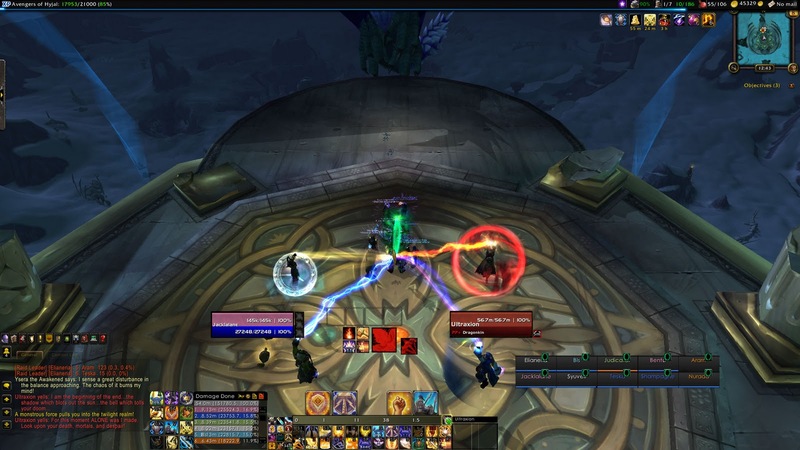 For Ultraxion attempts, our raid has the following DPS composition: Shadow priest, fire mage, survival hunter, enhancement shaman, and retribution paladin. We're missing both physical (like Blood Frenzy) and magic (Earth and Moon,) debuffs on the boss. Since we don't have a boomkin, warrior or rogue, we have to rely on our trusty hunter to fill in those gaps. Unfortunately for us, Judicator didn't have a wind serpent around for a magic damage debuff. I derped pretty hard when he told me he didn't have one. Given that a significant portion of our raid's damage is coming through the magic side, an 8% bonus would have been a ridiculous boon to us on this kill. One other obvious thing we're not doing here is pre-potting, or even using potions at all. I'll be doing this next week and encouraging others to do it. Most likely I'll come prepared with a supply of stuff to hand out. Min/maxing like this has never come easy to us. The fact that crafting mats are outrageously overpriced right now isn't going to help that at all, but that's a different post. Aside from utilizing potions and available debuffs, I think we could squeeze some more effectiveness out of our heroism use. We don't use heroism countdowns. Usually the raid leader just designates a general time for hero and a mage or shaman to cast the buff. The specified person just kind of fires off the spell without any sort of raid notification. This haphazard usage actually matters on fights like this. If we'd done a few hundred thousand less damage, I wouldn't have my shiny new tier chest and the guild wouldn't be working on soak-the-damage-loot ship. Certain cooldowns must be used before heroism for a maximum benefit. Our shaman has it easy because he knows to drop his spirit wolves before he casts heroism. Our shadow priest could get a decent benefit from his heroism burn by knowing to use his shadowfiend. Simple things like this, when combined with my other improvements, could make our next kill night and day easier than our first. Finally, when player deaths occur, using multiple sources of heroism to re-cast can help compensate for lost DPS. This was something we actually planned for if we died and got rezzed by Timeloop. We're bad at calling out for an iceblock or paladin bubble in the event of a low % wipe. This is an easy fix that could be beneficial, potentially. If we follow my suggestions above, we really shouldn't need this. However, having last resorts ready and waiting is going to pay off 100% of the time. I am a paladin. My main raiding spec is holy, but I'm often utilized as a DPS. Encounters like Ultraxion (read: where DPS matters,) are where I shine because I can usually do very competitive DPS, which helps the raid overcome things like high boss health or short enrage timers. -Seal of Truth got buffed in a couple of ways. First, Censure damage got a significant pre-4.3 buff. Secondly, Judgements got buffed in the form of a +20% damage done per stack of Censure vs 10% pre-4.3. -Blessing of Might now gives 20% bonus melee attack power vs 10% in 4.2. Now, it was openly stated that these changes, were part of Blizzard's plan to make ret less bursty and reliant on proc damage. Given my experience with ret so far, I think the 4.3 changes failed in these two respects. However, it is still extremely obvious to me that ret has been buffed. I definitely pew with more pew than I did in 4.2. 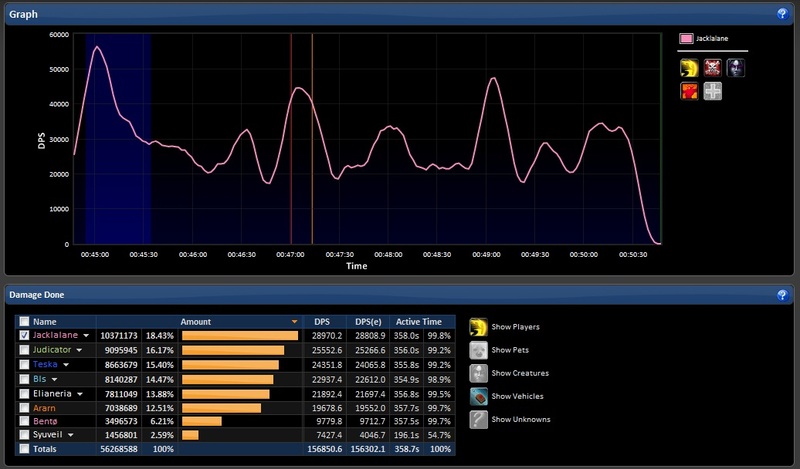 All that being said, lets look at the correlation between my procs and DPS across a few Ultraxion attempts. Of our 13 pulls, only six of them were over five minutes. These will be the parses I look at, in order to be able to compare each one as equally as possible. As you can see, I managed to do 25.5k DPS on average, which is sufficient for the requirement this fight carries. Since I'm really only looking at five wipes out of twelve (which I cant figure out how to make a graph for without using excel,) it's important to note that over those attempts I averaged out to 25.08k DPS. Could be better, but it is again, sufficient for the encounter if the other DPS are on par. Secondly, here is a chart containing my two DPS procs, Divine Purpose and The Art of War. Again, this graph is a cumulative collection of data from all twelve wipes. 146 Divine Purpose procs divided by twelve attempts comes out to just over twelve procs per attempt. Keep in mind that this is skewed to be a bit low because it's including a lot of 2-4 minute fights. The real average over the five relevant wipes is 15.8 procs per attempt. This comes out to 2.8 Divine Purpose procs per minute, based on an average fight time of 5 minutes 41 seconds. Art of war procs are similarly grouped, although wipe #2 had a stupidly low number which has skewing effects. 180 total AoW procs comes out to 15 per fight, based on the twelve wipes. The five wipe numbers come out to a much higher 21 procs per fight. That's 3.7PPM if you're wondering. So, to recap, the average wipe was 5 minutes 41 seconds with about 16 DP procs and 21 AoW. These numbers combined to net me an average of 25,000 DPS. Obviously other factors come into play for DPS production, like random crit streaks and whether or not Landslide procs line up with other significant DPS events. This analysis is based entirely on speculating that these two procs have a profound impact on my boss damage. My DPS comes in almost 4k higher than the average from wipes. That's some pretty serious RNG. Dear Blizzard, you didn't fix how proc reliant Ret paladins are. Thanks for the DPS buff anyway! Divine purpose procs come from the talent bearing the same name. Due to the nature of how this mechanic works, everything a ret paladin does damage with (except consecrate,) has a chance to proc DP. That means procs can cause procs. This is an important concept because I know it's what's responsible for the 29 Divine Purpose buffs that drove my DPS up in our Ultraxion kill. DP allows DPS to increase so much because it has several effects. 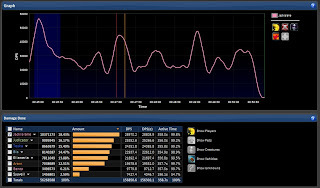 First, it grossly simplifies Inquisition uptime. Taking 3 crusader strike cycles out of the equation means casting more Templar's Verdict (TV), which is the most ideal use of DP unless Inquisition is about to fall off. More TV is the second benefit to DP. The third is proc chaining. The Divine Purpose talent states that ret DPS abilities can proc the talent. Most importantly, what this means is that the more abilities you cast per minute, the greater chance you get to proc. That means increased procs can chain and allow for TV spamming. Art of War procs have the same effect. Exorcism is a fantastic ability that does high damage in its self, but the procs themselves allow for more potential instances for DP to activate. The proc frenzy is something you either live or die by (sometimes literally) as a ret paladin. I'm looking forward to next week to see if I can best my numbers and improve both myself and the raid with some of the tips I've covered in this post. Also, I've spent some time in LFR and have added Gurthalak, Voice of the Deeps and Backbreaker Spaulders to my ret set. LFR was a great success. Stupid easy. Along with getting Creche of the Final Dragon from our kill, I'm hoping to see an increase in output. Jack and his new tentacle friends have some surprises in store for Ultraxion! Rawr tentacles casting mind flay for the win.